Sign up at DuduBet Casino on our site to be able use the promos and coupon codes listed below. DuduBet Casino is an exciting and sophisticated online casino that invites you to enjoy slots, virtual betting, video poker and lottery games from top industry providers like NetEnt, Endorphina, Playson, Cyrptologic, Pragmatic Play and many others. Established in 2016, DuduBet is owned by Radon B.V. Casinos and is licensed and regulated by Curacao eGaming. While an Instant-Play casino, DuduBet also hosts a mobile offering that is compatible with several different mobile devices including iOS, Android, Blackberry and Kindle. Enjoy playing games from your tablet or smartphone. There is also a generous Welcome Offer at DuduBet for new players, giving them the chance to boost their bankroll right from the start. In addition, the casino awards free spins on sign up with no deposit required! Dudbet Casino online games are 100% fair and a random number generator is used to ensure entirely random results. The casino is also responsible, ensures secure funds transfers and is multilingual. Turkish, Polish, Spanish, Chinese and English languages are available. What makes this particular online casino quite impressive is it features a variety of casino games from both well-known and less-known high-quality providers, such as NetEnt, NextGen Gaming, Cryptologic, 1x2gaming, Playson, Pragmatic Play, Endorphina, ELK Studios, ZEUS Play, Patagonia, Genii, MrSlotty, WorldMatch, Casino Technology, BetConstruct, MultiSlot and Pari Play. Its library of casino entertainment includes games in the following categories: Slots, Virtual Betting, Lottery and Video Poker. Slot machines definitely make up the casino’s largest selection of games and include classic slots, video slots, and branded slots. 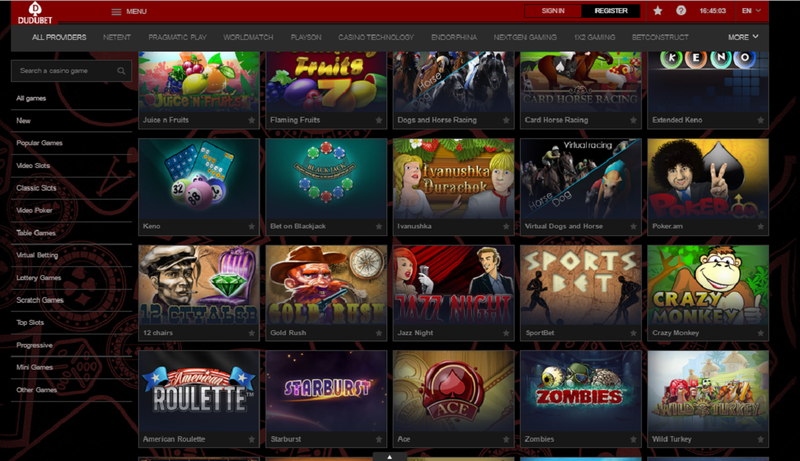 Spin the reels of hot titles like Jack and the Beanstalk, Scarface, Jack Hammer 2, Gonzo’s Quest, Mythic Maiden, Secret Code, Piggy Riches, Evolution, Dead or Alive and many, many more. Players who are looking for more than slots will be pleased to find other exciting games at DuduBet including a wide range of table games, which features several variants of Roulette and Blackjack. There are also virtual betting games like Virtual Dogs and Horse, lottery games and scratch cards. 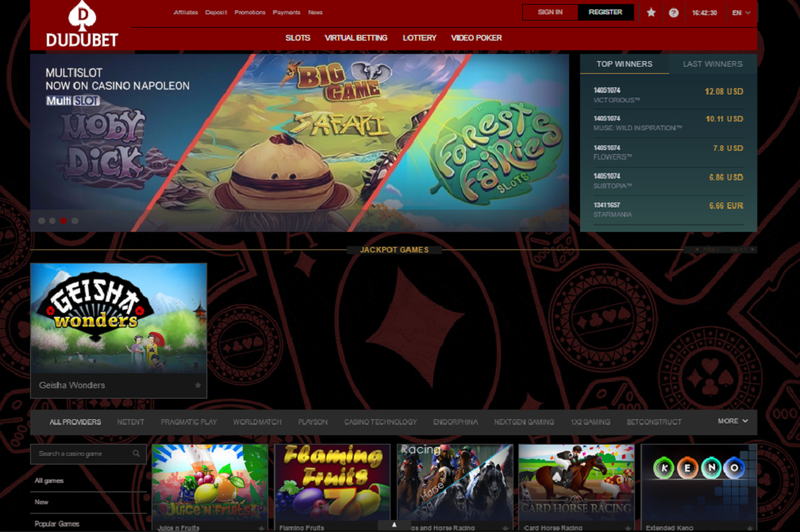 All games can be accessed online instantly via PC and Mac. There are not as many DuduBet Csino mobile games, but there is still a decent selection for players who like to game on the go. At the time that this DuduBet Casino review was written, there was no live game offering. Signup at DuduBet Casino and you’ll instantly receive 10 Free Spins on Starburst with no deposit necessary. However, when you are ready to make your first time deposit, you’ll have the opportunity to take advantage of a fantastic signup bonus that rewards you over your first 3 deposits. On your 1st deposit you can claim up to €300. On your 2nd deposit you can get up to €150 as well as 50 Free Spins on NetEnt’s slot NRVNA. On your 3rd deposit you can get up to €300 and 50 Free Spins on another NetEnt slot, When Pigs Fly (bonus terms and conditions apply). Beyond the Welcome Offer there does not appear to be any other promotions offered at this time. DuduBet Casino payment methods include Skrill, Neteller, Moneta.ru, Visa, MasterCard, Alfa Bank, Yandex Money, WebMoney, ecoPayz and more. Deposits are instant and are without fees. However, not all methods are available for each jurisdiction. You can make withdrawals using Skrill, Neteller, Moneta.ru, AstroPay, EcoCard and DengiOnline Webmoney. Processing times for withdrawals are very fast and typically occur within hours. There are no withdrawal fees. Live chat, email, telephone and FAQ are all available help methods for players seeking DuduBet Casino customer support. With so many great options, you shouldn’t have a problem finding the answers you need. DuduBet Casino has supported play on mobile platform, you just hold your smartphone at the image area to get the direct link to DuduBet Casino on your mobile.